I always get asked what tools I use to create some of the creative food I do on my main instagram page and so I decided to do a blog post in collaboration with Go Cook, exclusively for Tesco on all the tools that I find super cool and super useful in the kitchen. The Go Cook (exclusively for Tesco) is a new professional-quality cookware line, with each product being carefully crafted to be practical and durable, with clever details such as heat-resistant handles and their unique Contour Wave System. All of this being available in Tesco means that a range of high quality cookware products are available to me right on my doorstep, helping to take my recipes and cooking to new levels. If you follow me on instagram you will realise that I am obsessed with melon balling :-o. I always get asked how do you do your chia balls (aka dragon fruit balls :-)) so I will start with demonstrating the tool that I use on daily basis, the melon baller but this time I use it to make a fun autumn inspired apple dessert! 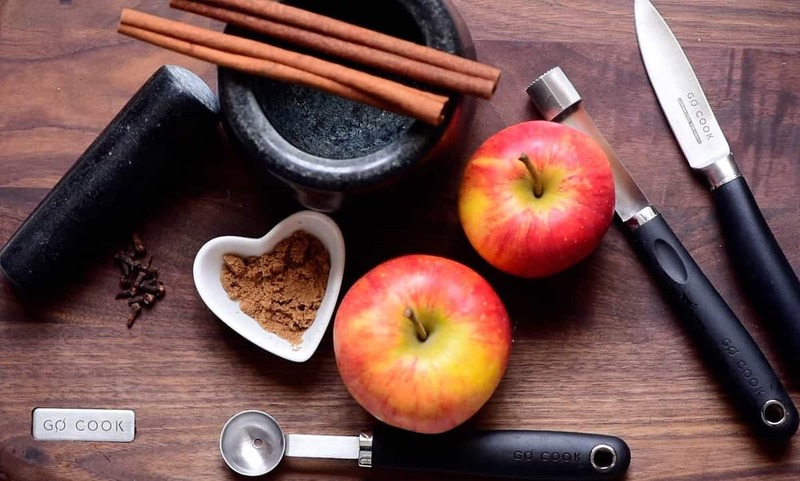 These are the ingredients and the tools I used to create a fun apple bowl. 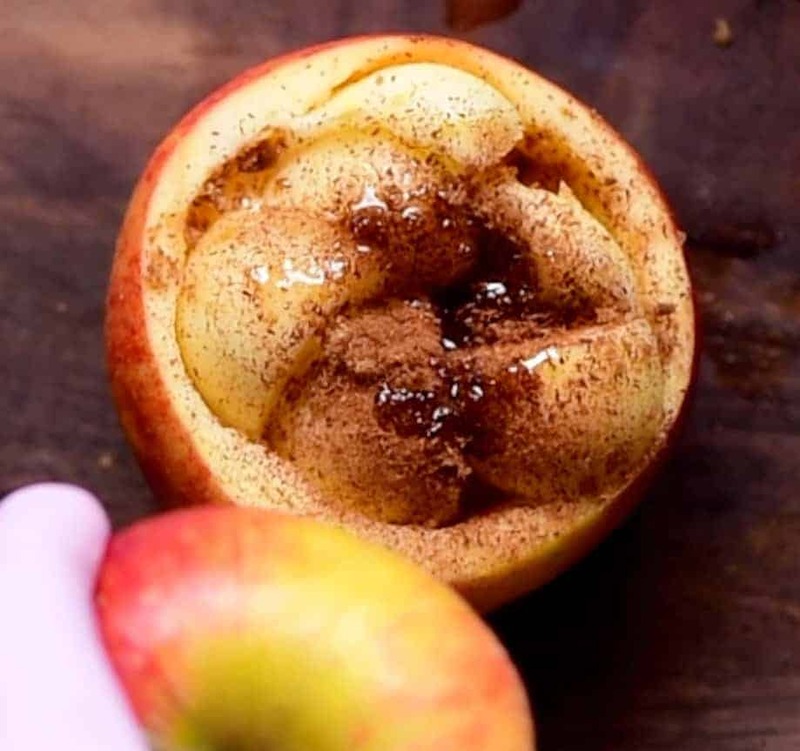 Mainly couple apples, cinnamon stick, brown sugar and few cloves. I forgot to add walnuts (it will add awesome crunch). I’ve prepared everything on this natural chopping board because is perfect for every kind of food and very safe to use thanks to its rounded corners. I love this chopping board because it’s very strong and thick and love the colour, perfect for big knives. I love grinding my own spices and also I I have obsession with autumn spices and you will see lots of new recipes using them in my blog. I used here the Pestle & Mortar. This carved black granite pestle and mortar is easy to use and perfect for grinding herbs and spices. I couldn’t get over the smell of fresh spices which stayed in my kitchen throughout the day. With the apple I used first the Apple Corer to core the apple (aka create a border that is not needed) and I found it very easy to use thanks to soft-touch handle that provides a comfortable grip and it is perfect for quick snack or elaborate fruits plates like salad or like in this case a dessert recipe. 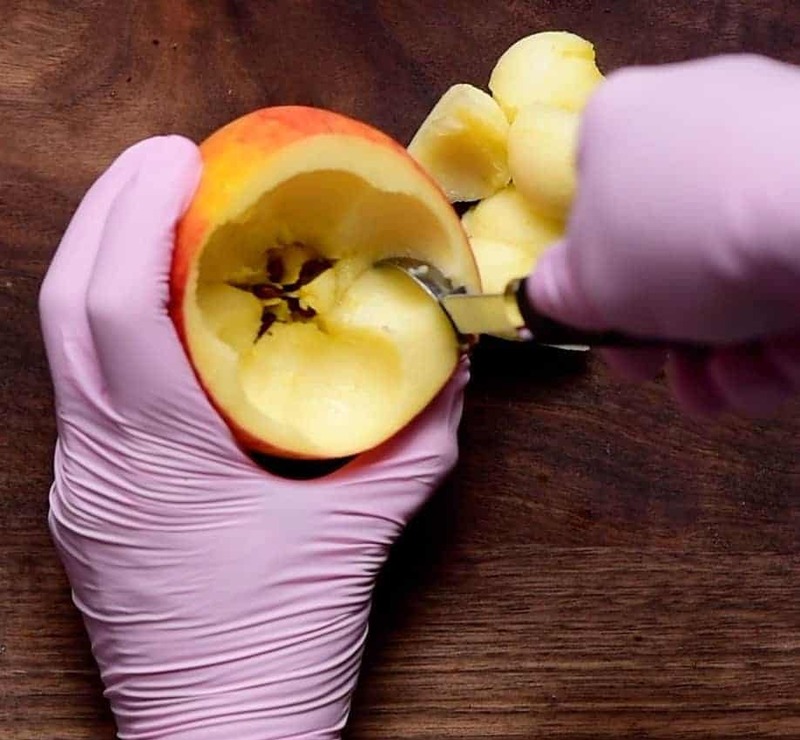 Here I used the melon baller to prepare perfect and uniform balls for the inside of my apple. The grip is easy and this utensil is, of course, perfect for the melon too. I sieved the spices (to getrid of course bits into the melon balled apple pieces and added a bit of brown sugar in between. 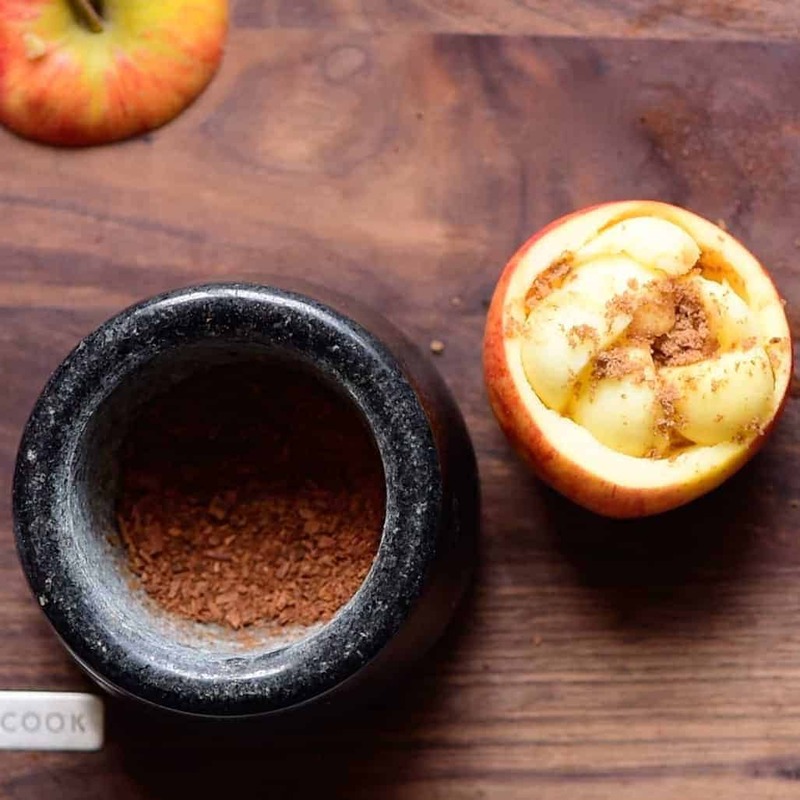 Added a tablespoon of coconut oil and placed the apples in a oven tray and added about 1/2 a cup of water to the tray to keep everything moist and baked for about 20 minutes at about 180 degrees Celsius. After cooking, I used the Silicone Turner, perfect for every pans including those with non-stick surfaces (and don’t worry for the temperature it is in silicone and resistant to a high temperature), to place the baked apple on a serving dish. I topped the apple with coconut cream (so yummy with the coconut creme), you can use natural yogurt if you prefer but I feel this goes greatly with the coconut creme instead! First of all I cut the pineapple with the Chef’s knife which makes very easy to have a professional result. In fact it cut precisely through all kinds of meat and vegetables. After sliced the pineapple I used my (26cm) non stick Frying Pan to cook the pineapple, with a pinch of sugar, for 3 minutes for each side the slices. This frying pan, very easy to manage thanks to the soft silicone handle, works on all hobs, including induction, it’s very resistant and has an high cooking performance. I love fresh coconut and instead of dried shredded coconut I love to use fresh ones. I’ve loved to use Julienne Peeler to get finer shreds! This peeler creates fine uniform strips and it’s very easy to use because of its soft-touch handle. With the Paring Knife I’ve precisely cut some fruits to make more delicious my pineapple pizza. Another fun tool that I am slightly obsessed with especially when I have guests (that I want to impress a bit :-)) is the awesome Mandolin Slicer. This allows me to play so much with rainbow food (I love creating really thin sheets of radish and beetroot and use them as the base (think of it as a wrap but it’s so much more colourful and healthier). For making perfect slices I’ve used mandoline slicers. Unlike the others this mandoline is very easy and it has a safe grip (handle). During the use I could see how every vegetables were evenly sliced. Then I used the Melon Baller. How I said before is perfect for vegetables too. I also used the Y peeler for some final touches and perfect slices of vegetables. It was so fun see all that colours that you can see now. And like the cherry on the cake, let’s not forget the avocado topping. I love the avocado slicer especially that it creates, thanks to a good blade, nice uniform shapes if you’re obsessed like me with patterns haha… note here that the avocado can’t be very ripe for this otherwise it will be too squishy! And last but not least the citrus elements are essential. I LOVE lemon zest and ever since I discovered the Citrus Zester, I sprinkle lemon zest on almost everything … especially avocado on toast! The citrus zester is perfect with citrus, fruits, ginger, cinnamon, nutmeg and more. 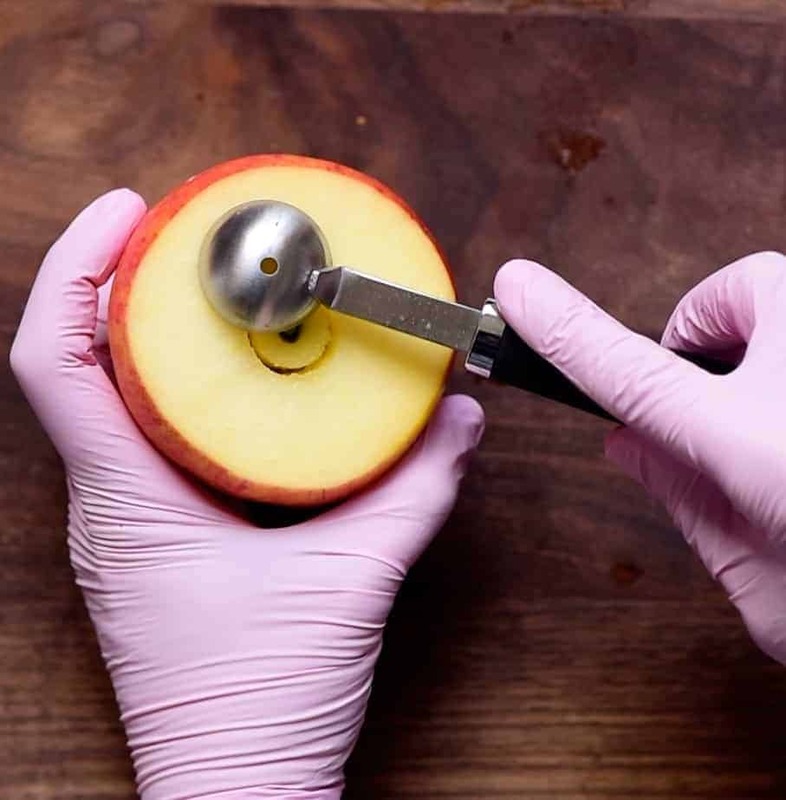 The soft-touch handle allows a good grip and makes easy zesting your food. In the end I squeezed lemon, with the Citrus Press, on all of my colorful vegetables. This post is sponsored by Tesco. The views expressed in this article are completely mine and made with love as always.